Ousmane Dembele is back. The French forward, who injured his hamstring on March 13 against Lyon, returned against Huesca, playing 67 minutes of the goalless draw. 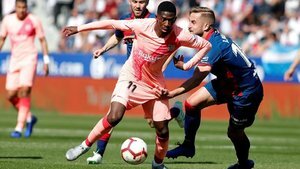 Dembele, after four weeks out, showed that he's in shape to play a part in the end of the season as Barça compete for the treble: La Liga, the Champions League and the Copa del Rey. The former Borussia Dortmund man missed five Barça matches (Betis, Espanyol, Villarreal, Atlético Madrid and Manchester United -- although he was on the bench for the latter) as well as two France qualifiers for Euro 2020. Barça's No.11 started at El Alcoraz and even though he wasn't at his best, he showed he's ready to make an impact in what's left in La Liga (six games), the Champions League game (one game could become four if Barça reach the final) and the Copa (the final). On Saturday, he partnered Kevin Prince Boateng in attack and was the most dangerous of the two. He had a good chance in the 16th minute after a clever pass from Riqui Puig. His shot was saved and pushed behind for a corner. In the second half, in the 66th minute, just before going off, he shot just wide. Dembele is likely to be on the bench against United in Tuesday's second leg, but he will get minutes. Ernesto Valverde wants him at 100 percent for the final stage of the season.